Since December, God has been speaking to my heart about prayer. He made is clear that my word for this year should be prayer. And that my verse of the year should be 1 Thessalonians 5:17. I will admit, I was kinda sad that I didn't get a "cool kid" word at first, but quickly realized that was just my spoiled brat nature coming out in me. Over the past few months, I've spent lots of time in prayer. I've kept a prayer journal (which I LOVE) and I've been studying prayer. If it's going to be my word for the year then I should know as much as I can about it. 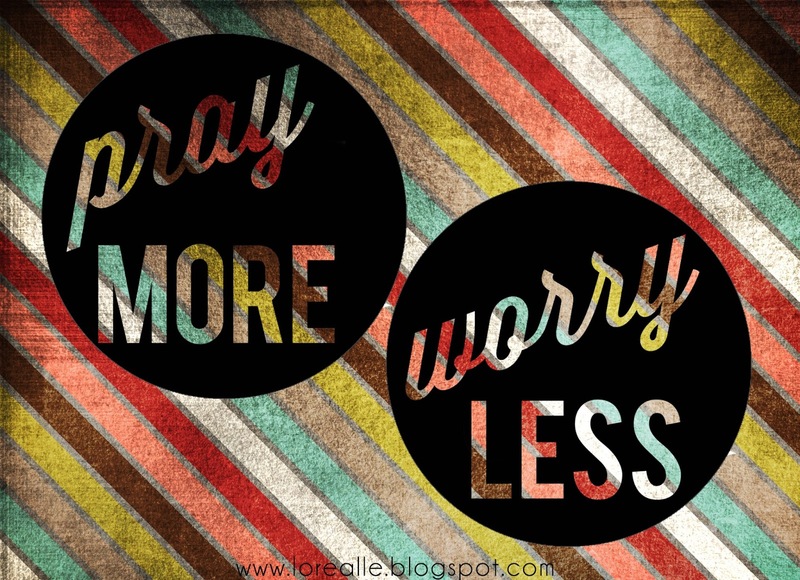 And with that, our next Bible study here at Forever Beloved was born...simply titled Pray More, Worry Less. And I am SUPER excited!!!! This girl right here is a worrier by nature. Ugh, any of y'all with me on that one? It's not one of my better qualities. I worry about paying the bills, about Joey driving, about my dog having arthritis, about Joe's work, my family's health, about my housework, about my business, blah blah blah on and on. My to-do lists keep me awake at night. Because clearly laying awake at night worrying will get my chores done, right? Questions like what if and should I have swirl around my mind, holding me hostage and keeping me chained to my worries and fears. The trouble with worry is that it doesn't seem all that harmful. It has taken on the form of a acceptable sin. We all do it...so, why even call it a sin? Come on, it's just a little thought in our mind that no one else can see or hear. Let's just gloss over it, sweep it under the rug and call it a day. Or better yet, let's rename it. That way we can not feel guilty about it. Let's call it stress, anxiety or just concern. Yes, glad we solved that one! But wait, renaming it stress and pretending it's not a sin doesn't make me feel any better. I still feel yucky and I still lay awake at night thinking about scrubbing my carpets. Join us here each Friday as we discuss getting rid of that never-ending feeling of doom by handing all our worries (and dirty carpets) over to God. Our study will wrap up on Good Friday. We can either keep getting upset and feeling hopeless or face our problems in a more positive and faith-filled manner by continually seeking and trust in the Lord by giving Him our burdens continually.